Original Editors - Abby Naville and Alex Piedmonte from Bellarmine University's Pathophysiology of Complex Patient Problems project. Conversion disorder is a rare psychodynamic occurrence that consists of the physical expression of an unconscious conflict or stressor in a person’s life. This physical expression is characterized by a recent psychological stressor that converts into physical signs and symptoms that are inconsistent or cannot be explained by known anatomy or physiology. This patient population is not intentionally simulating symptoms but is genuinely experiencing them. Symptom presentation consists of the patient’s conception of a particular disease process therefore their presentation will not follow typical or expected patterns, such as dermatome, myotome, and sclerotome changes. The physical therapist should carefully document these changes in order to recognize discrepancies. Conversion disorder is also known as “hysterical neurosis”, “conversion type”, or “functional neurological symptom disorder”. It falls under the classification of ‘somatic symptom disorder’ according to the DSM-V, a change from the DSM-IV which included a large cluster of disorders known as somatoform disorders that are also recognized under this new heading. Different presentations of conversion disorder can be reported under the ICD-10-CM codes of F44.4, F44.6, and F44.7, depending on whether the symptoms are motor, sensory, or mixed. The prevalence of conversion disorder varies depending on the population being studied and whether or not conversion symptoms are reported. It is estimated that the prevalence ranges from 0.01% to 0.5% of the general population. Additionally, 20-25% of patients in a general hospital setting experience symptoms of conversion while only 5% of patients are diagnosed with conversion disorder. In a neurological setting the prevalence increases. A study found that 14% of 100 consecutive patients admitted to a neurological ward did not have objective evidence of neurological disease. Conversion disorder is more commonly seen in women with the age of onset spread across the lifespan. The ratio of females to males ranges from 2:1 up to 10:1. Prognosis is best for patients that have acute onset of symptoms or have symptoms immediately following an acute stressor. These patients stand the best chance of recovery and will do so in a matter of a few weeks. Young children and adolescents tend to have better outcomes. Symptoms of tremor or seizure are more persistent while aphonia, blindness, and paralysis tend to improve. A minority of patients experience symptoms chronically, but is usually correlated with an associated personality disorder. A. One or more symptoms or deficits affecting voluntary motor or sensory function suggest neurological or other general medical condition. B. Physical findings provide evidence of incompatibility between the symptoms and recognized neurological or medical conditions. C. The patient is not feigning or intentionally producing his or her symptoms or deficits. D. The symptom or deficit causes clinically significant distress or impairment in the social, occupational, or other important areas of functioning or warrants medical evaluations. There is emerging literature on structural imaging and functional MRI’s of the brain in people with conversion disorder. Studies have shown that those with conversion disorder tend to have reduced volumes of right and left basal ganglia and right thalamus compared to others without conversion disorder. When looking at a functional MRI of a person with unilateral sensory loss in the hand, thought to be from conversion disorder, activation in the contralateral somatosensory region appeared when the uninvolved hand was stimulated. When the involved hand was stimulated, there was no such activation. This is important for future diagnostic criteria; however, functional MRI technology is still highly experimental when looking at conversion disorder. Do you worry about finances, work or life in general? Do you have a fear of being in groups of people? Fear of flying? Public speaking? If a patient is positive for these questions, they may not be aware that depression, anxiety and panic disorder can contribute to their physical symptoms. Hoover's sign is a manoeuvre a physiotherapist may use to help in their diagnosis of conversion disorder. It is a special test aimed to separate organic from non-organic paresis of the leg. The sign relies on the principle of synergistic contraction. Involuntary extension of the unaffected leg occurs when flexing the contralateral leg against manual resistance. To perform the test, the physiotherapist should hold one hand under the heel of the unaffected limb and ask the patient to flex the contralateral hip against resistance (supine position), asking the patient to keep the affected leg straight while raising it. If the patient is making an honest effort, the physiotherapist should feel the unaffected limb's heel extending (pushing down) against their hand as the patient tries to flex the affected leg's hip. Feeling this would indicate an organic cause of the paresis. However, if the physiotherapist does not feel the unaffected leg's heel pushing down as the patient flexes the hip of the affected limb, then this suggests functional weakness. Conversion disorder is largely attributed to psychological conflicts or stressors. A patient displaying conversion symptoms is channeling their distress into physical expression, which is usually followed by a reduction in a patient’s anxiety. 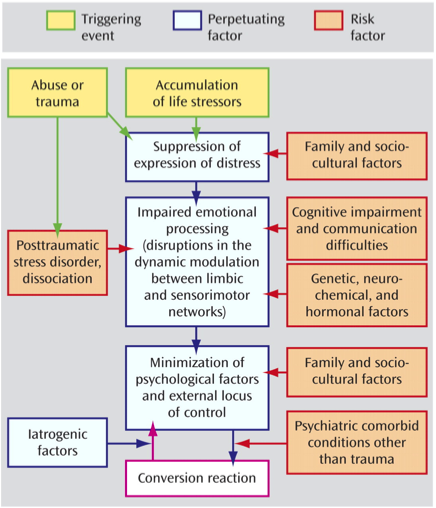 Thus, most theories about why conversion disorder manifests are based on Freudian concepts of suppression and avoidance as an unconscious defense mechanism against traumatic events. Often, symptoms are a reflection of a medical condition that a patient has witnessed in another or that they have experienced previously. However, this disorder is not premeditated and it is thought that the symptoms may be a sign or symbolic representation of emotions that the patient is unable to express in words. The translation of emotional stress into conversion symptoms is recognized as the primary gain of the disorder, where the conflict is limited to the unconscious thus leading to reduction in the patient’s anxiety. Whereas external benefits, such as avoiding obligations or receiving attention from loved ones, are defined as secondary gain. If not addressed these can become perpetuating triggers that create a barrier to remission of conversion symptoms. The pathophysiology of conversion disorder is not well understood and is not the current basis for treatment. However, functional imaging of the brain suggests that neural circuits connecting will power, movement, and perception are disrupted in conversion disorder. These studies are limited by small numbers of participants and varying study designs thus there have been no substantial conclusions. After diagnosis is made, a psychiatrist will proceed to inform the patient that neither examination nor diagnostic tests have shown any damage to their neurologic system. The patient is then educated that even though the direct cause of their symptoms is not known, it is common for similar patients to recover in a matter of a few weeks. It is also common for symptoms to resolve without treatment. Some viable treatment options, depending on how the patient presents and their past medical history, are listed below. Research has shown that physical therapy can be an effective method of treatment for patients with conversion disorder. During an initial evaluation of a patient, a thorough history should be taken to rule out any organic neurological, orthopedic, or cardiovascular condition. Any new stressors in one’s life should be noted along with any psychological distress and history of abuse. Objective measures should be taken to validate the patient’s beliefs that they have a condition that is causing their impairments. However, after the initial evaluation these conversion symptoms should be ignored to prevent reinforcement of behaviors. During manual muscle testing, true weakness results as “giving way” of a muscle group and hysterical weakness is presented in a series of jerks. Manual muscle tests are not consistent with functional abilities of what is observed. Once the conversion disorder is confirmed, the therapist should develop good rapport with this patient as they are currently experiencing psychological stress. The therapist needs to be very patient when working with patients who are having difficulty adjusting to the stress of illness and disability. Depending on how the patient presents, physical therapists should treat the impairments as they would if the patient had a neurological condition with an organic cause. It has been shown that progressing exercises from simple tasks to more challenging ones has been effective in those with neurological disorders and is no different in those with conversion disorder. The therapist should progress the motor skill and provide less verbal and tactile cueing along with less assistance.Physical activity and exercise have known benefit in the management of mild to moderate psychologic disorders. Aerobic exercise or strength training have both been shown to be effective in moderating psychogenic symptoms. Due to the psychological component of conversion disorder, behavioral modification should be incorporated into the treatment sessions in physical therapy. A patient with conversion often assumes the role of a “sick person.” When people recognize their illness this reinforces their behavior. In a physical therapy session, when these unwanted behaviors (ataxia, loss of balance, and paralysis) occur, the therapist should not comment on the impairments and only give positive feedback when the patient performs well (normal movements, strength, and gait). The therapist should educate the family members and other interdisciplinary team members on the behavioral component to lead to a better recovery for the patient. Examples of treatment: for a patient presenting with paralysis or weakness, consider working on pre-gait activities such as sit-to-stands, weight-shifting in multiple planes, mini-squats, lunge matrices, balance activities, etc. Gait activities should include stair management, dual-task activities, adjustment of gait mechanics, etc. Next, it is important to incorporate activities that will help the patient with participation, especially with activities of daily living. Bringing in components of the patient’s daily activities during treatment will help to expose them to stressful situations and find ways to manage or cope outside of the clinical setting. This will help to decrease the likelihood of relapse in the future. Organic background: Thorough examination must be done to rule out any condition of organic nature that may present in the same way as the conversion. General diagnosis that could potentially present this way include: myasthenia gravis, idiopathic dystonia, systematic lupus erythematous and multiple sclerosis. Psychological Background: There are two types of psychological conditions that may present with signs and symptoms of conversion disorder; voluntary and involuntary. Factitious disorder: Physical and mental symptoms voluntarily produced by a patient for the motive to take on the role of a patient. They typically present with exaggerated symptoms, great knowledge of medical terminology, and numerous previous hospitalizations. Malingering: Physical and mental symptoms voluntarily produced by a patient for the motive of a secondary gain (vacation, released from jail, compensation, etc). This differs from factitious disorder because the patient does not have any psychological need to take on the patient role; this is simply for a personal gain. Involuntary psychological conditions can present like conversion disorder and are often co-morbidities to conversion disorder include: anxiety, depression, borderline personality disorder, post-traumatic stress disorder, and dissociative disorder. ↑ 1.0 1.1 1.2 1.3 1.4 1.5 Goodman C, Fuller K. Chapter 3: Pain Types and Viscerogenic Pain Patterns. In:DifferentialDiagnosis for Physical Therapists: Screening for Referral. 5th Edition. St. Louis, Missouri: Saunders Elsevier; 2013:144-145. ↑ 2.00 2.01 2.02 2.03 2.04 2.05 2.06 2.07 2.08 2.09 2.10 American Psychiatric Association Diagnostic and statistical manual of mental disorders. 4th ed Washington (DC): American Psychiatric Association; 1994. ↑ Conversion Disorder: Definition. Mayo Clinic Website. http://www.mayoclinic.org/diseases-conditions/conversion-disorder/basics/definition/con-20029533. Accessed on March 14, 2014. ↑ 4.0 4.1 Patient.co.uk Somatic Symptom Disorder. Patient.co.uk website.http://www.patient.co.uk/doctor/somatic-symptom-disorder. Accessed on March 20,2014. ↑ 5.0 5.1 5.2 American Psychiatric Association. (2013). Somatic symptoms and related disorders. In Diagnostic and statistical manual of mental disorders (5th ed.). doi:10.1176/appi.books.9780890425596.744053. ↑ 6.0 6.1 6.2 6.3 6.4 6.5 Feinstein A. Conversion disorder: advances in our understanding. CMAJ: Canadian Medical Association Journal [serial online]. May 17, 2011;183(8):915-920. Available from: Academic Search Premier, Ipswich, MA. Accessed March 14, 2014. ↑ 8.0 8.1 Conversion Disorder: Symptoms. Mayo Clinic Website. http://www.mayoclinic.org/diseases-conditions/conversion-disorder/basics/symptoms/con-20029533. Accessed on March 14, 2014. ↑ Mace C, Trimble M. Ten-year prognosis of conversion disorder. The British Journal Of Psychiatry: The Journal Of Mental Science [serial online]. September 1996;169(3):282-288. Available from: MEDLINE, Ipswich, MA. Accessed March 14, 2014. ↑ 10.0 10.1 Sar V, Akyüz G, Kundakçi T, Kiziltan E, Dogan O. Childhood trauma, dissociation, and psychiatric comorbidity in patients with conversion disorder. The American Journal OfPsychiatry [serial online]. December 2004;161(12):. Available from: MEDLINE, Ipswich, MA. Accessed March 14, 2014. ↑ Conversion Disorders Clinical Presentation: History, Physical, Causes. 2017. Available from: http://emedicine.medscape.com/article/287464-clinical. Accessed March 31, 2017. ↑ 12.0 12.1 12.2 Conversion Disorder: Treatments and Drugs. Mayo Clinic Website. http://www.mayoclinic.org/diseases-conditions/conversion-disorder/basics/treatment/con-20029533. Accessed on March 14, 2014. ↑ Koehler PJ, Okun MS (November 2004). "Important observations prior to the description of the Hoover sign". Neurology. 63 (9): 1693–7. ↑ 14.0 14.1 Feinstein A. Conversion disorder: advances in our understanding. CMAJ: Canadian Medical Association Journal = Journal De L'associationMedicaleCanadienne. May 17, 2011;183(8):915-920. Available from: MEDLINE, Ipswich, MA. Accessed March 14, 2014. ↑ 15.0 15.1 15.2 Heruti R, Levy A, Adunski A, Ohry A. Conversion motor paralysis disorder: overview and rehabilitation model. Spinal Cord. July 2002;40(7):327-334. Available from: MEDLINE, Ipswich, MA. Accessed March 14, 2014. ↑ 16.0 16.1 16.2 16.3 Cynthia M. Stonnington, M.D. ; John J. Barry, M.D. ; Robert S. Fisher, M.D., Ph.D. Conversion disorder. The American Journal of Psychiatry. September 01, 2006;163(9):. Accessed March 14, 2014. ↑ 17.0 17.1 17.2 17.3 Heruti R, Levy A, Adunski A, Ohry A. Conversion motor paralysis disorder: overview and rehabilitation model. Spinal Cord. July 2002;40(7):327-334. Available from: MEDLINE, Ipswich, MA. Accessed March 20, 2014.